Sony’s most hi-end SLT camera proves that a tight budget doesn’t make any compromise with technical specs. Let’s analyze it to see what’s right. Introduced with NEX-F3 concurrently, Alpha 37 is designed to look more serious. Two models may share common specs but Sony stated that the kinds of buyer would be different. While NEX-F3 aims at home users who are looking for way to record children at holidays, Alpha 37 targets people whose desire is to become photographer rather than to capturing simple photo. Apparently, Alpha 37 looks similar to basic DSLR cameras. However, it is distinguishable because Alpha 37 is truly not DSLR due to lack of the important pentaprism and moving mirror. Instead, this SLT compact uses fixed semi-transparent mirror which can redirect 30% of the light to AF sensor while the rest 70% goes straight to main sensor. At present, Sony has launched SLT cameras for basic, mid-class and hi-end segments, with 2 DSLR models, one mid-class model (Alpha 580) and one professional model (Alpha 900). 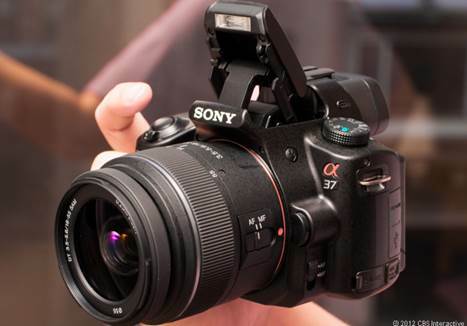 SLT seems to be Sony A-mount camera’s future but now can they rival best DSLR cameras? Alpha 37 is an upgrade of Alpha 35, which was released in last June. This is such a short service life, even for a digital camera, but the update aims at compact and basic SLT models, thus the decision lies on how user wants to use their camera. Like NEX-F3, Alpha 37 owns a 16.1MP Exmor CMOS sensor powered by Bionz III processor. It can produce 3264x4912pixel images or A3 paper at 300ppi resolution. File can be saved as JPEG or ARM (Sony’s RAW) format. The device comes with Sony’s Data Converter SR program and raw format is supported by latest updates fir Camera Raw of Adobe and Lightroom. ISO sensitivity has been extended from 12,800 (on Alpha 35) to 16,000 (on Alpha 37). Though EV was raise by 1/3, the camera is still so impressive. This new sensor makes it easy for HD video recording – a field that has been watching manu progresses in digital cameras over years. Anti-shock SteadyShot is also available, letting any lens benefit from technology. This is what makes Alpha 37 different from NEX compact, which should be born in mind of whoever wants to apply old lens onto the camera. As Alpha 37 uses digital viewfinder, anti-shock based on sensor is an advantage for any arrangement, helping to stabilize frame. Light measurements haven’t changed since Alpha 35. They provide users with 1200-zone evaluative metering in modes: Multi-segment, Center-weighted, Spot. Exposure compensation – unchanged – seems quite limited with -/+3EV while -/+5EV is now the standard in most models. Normal PASM modes do present and gets improved by a part of automatic modes and features giving for simpler and easier control for some advanced features. Intelligent auto mode accompanies iAuto+ (Super Auto), which includes auto scene detection, continuous shooting and HDR. Therefore, if necessary, it will execute a mass of photos and process them into one single file to deal with conditions having high contrast or low lighting. Sweep Panorama is also included, enabling user to stick real-time photos in order to create a panorama when casting the camera horizontally. Resulted photo can be saved as 2D or 3D format. 7fps shooting, seeming impressive, is only available in a limited scenario and the more modest 5.5fps is the maximum level in practice and used in most modes. There’s option for fast shooting at 7fps on disk and it provides 8.4MP images cropped plus EV automatically adjusted. In fact, 5.5fps speed is quite enough for most users and in some real situation which needs faster speed, cropped vision may be useful, bringing a widened range from a specialized lens. And 8.4MP images are sufficient for most usages – beside small file size saves more storage. Using a high-speed Lexar Class 10 600x SHDC, Alpha 37 reached 21fps in high-speed cropped mode. In standard 5.5fps operation, frame rate reduced considerably, with 6 JPE pictures, 5 raw or 4 raw+ JPEG pictures. Writing a personal file took the camera 2.5 sec, for raw/JPEG files – this proves the processor is quite fast. Cache memory was mainly blamed for limiting the amount of shots. Alpha 37 share similar size and appearance to Alpha 33/35 but there’s a seeable concave part where user’s hand holds. The device’s compact size means that most users will be able to place their two fingers around its body thus this concave part plus rear area designed to fit the thumb is high appreciated. The camera’s case feels light but sturdy in high build quality. Many large buttons are well arranged. Some EV buttons allow wheel (before adjusting aperture or in manual mode) to switch from shutter adjustment to aperture adjustment. However, this button’s corner is not user-friendly unless you change the part where you hold the camera. Fn key gives access to most controls, regardless main menu, and it’s pleasant to see ISO control and white balance can be reached via fast 4-direction control disc. The central button enters AF setting, from where you are able to configure local and regional modes. Another smart feature presenting in most Sony models is Eye-Start, which activates focus whenever lens is pointed to eyes, reducing shooting time. It’s a pity that when the camera is placed at flank’s level, Eye-Start may activate when sensor is covered, which makes AF’s engine rattle while you are walking. It may be too noisy for camera attached with kit lens and there may be beep sound. Besides, it consumes energy.